Very sad news. Les Gruebner, a long time Bay of Plenty Tree Crops member, died quite unexpectedly on Monday night. No other details are available at the moment. Les was a major force behind NZTCA getting a website, and was also very encouraging to me producing this blogletter. He will be sadly missed. Thanks for the recent newsletter. I wonder if you can help me with something I think I read somewhere. I seem to recall reading in a newsletter somewhere an advert from an organisation that were buying up walnut shells for use in, among other things, the cosmetic industry. I’m reasonably confident I read it in a treecropper related document but now can’t find it anywhere. Was it in one of the walnut newsletters? Or do you perhaps know of someone that buys the shells. I’m up to about 40 litres so far and would like to see them do to some use. I cannot think of any NZ demand for walnut shells that I have seen advertised. Can anyone else help Patrick? We use ours to heat the house. Crain Walnut Shelling, Inc used to have a full page on their website of uses for walnut shell, but I cannot see that page on there anymore. Thanks again for your most interesting and helpful blog. It is so kind of you to go to the trouble of circulating yours, and others experiences, and contributing information..
Last season with our 20 odd mixed variety (Rex, Meyric, Franquette, Wilsons Wonder, Shannon, plus a few seedlings), and aged ( 2-30 years) trees was a medium yield year , opposed to last years bumper crop. Early and late nuts were black inside. The rest very good. That’s usual, I believe. I have started to apply Boron in the last couple of years and have noticed less ‘stag-heads”. I was going to send you the write-up of a fielday here by the local (BOP) Tree Crops Association, but it hasn’t appeared in their newsletter yet, so perhaps I am a bit premature. So, I have attached the write-up for the visit by the BOP Farm Forestry Assn. back in November. I cannot resist the temptation to edit it a bit. My changes in brackets. BOP Farm Forestry Friday 13 November: Nelson-Parker property, Wainui. On entering the property we drove past the lovely flowering Rhododendrons and parked under the loquat tree (yummy too). Nick gained his interest in forestry via his grandmother and a walnut tree she was offered two thousand pound for (which was equal to two years’ salary back then), so Nick thought, “I’m going to do that – grow walnut trees for timber.” He then went hmm I need to consider returns and cash flow impacts etc, and realised the importance of other species as well. He worked with Radiata pine for 17 years. They have been on this 26.7ha property for 38 years, and now have some 5ha planted in [wal]nuts. They struggled to get walnut trees established so they joined the Tree Crop Association and Farm Forestry Association and set up a nursery to fund his addiction to trees. Their soils are high in Potash. 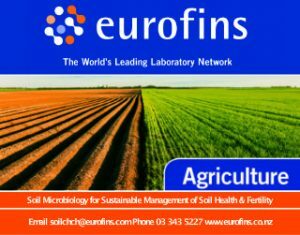 Nicks quote of the year “our soils are nutrient free”, just require a lot of micro nutrients (trace elements). Found boron is required. Uses leaf and soil analysis, but still believes visual is best. The trees tell you the truth. Started with seedlings, but is now convinced grafted stock do better. For the nuts none are really good- slowly getting there via selection. Use [have tried] pheromone traps for codling moths. Puriri moth is a nuisance in the walnut [tree] itself, but not a major concern. Have both a bacterial and a fungal blight affect the trees. Aim for straight stems rather than bigger diameter stems in early years- albeit diameter is important also. Lots different characteristic needed in your nut. Range meat to shell ratio in varieties range 35% with new American one at 50% and even known to achieve 62%. Varieties Nick had include Tulare, Lara, Diana, Shannon, 15A/1, Awakeri. Harvest nuts April/May. 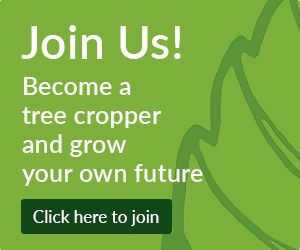 From 35 year old seedling trees get approximately 1T/ha, whilst the grafted blocks [Roadside 12] produce 2T/ha. The nuts sell readily in the markets. SR[plant]- tight early to hold form. A 1986 planted stand was at 400stems/ha now and these would be thinned to 80/100stems/ha in time. A 38 year old stand was at 160 stems/ha and just getting crown closure. If planning to mill in future do [logging] cuts in late autumn (May/June) so don’t get checking and splitting [in the log]. Form prune in November, take out biggest branches in crown. Nick will do a double cut to avoid strip tears[down the trunk]. Jaap suggest cutting at the stump of non-straight trees and letting coppice which would send up a nice straight leader over the first few years. Nick mentioned they did do this in UK. What/how select wood/nut. Lot discussion around these topics. We also inspected some Chinese cork oak and another proper cork oak (better [cork] timber). Paul Silcock from NZ Forestry Ltd spoke of their black walnut trials in Whangamomona (The forgotten Highway). Some were in stands of 950 stems/ha being half alders as a nurse crop. I don’t have access to the photos they posted, so have attached one of my own, unfortunately without their happy faces. ..walnut (J. regia) to be exploited as tree species suitable for forestry plantations, recently had a lot of impulses from the Italian Agricultural Ministry and, specifically, with the promotion of the Riselvitalia project. In the framework of the above mentioned project the “Istituto Sperimentale per la Selvicoltura” of Arezzo has developed a research aimed at the exploitation of some selections of a J. nigra population, identified in North Italy and characterized by a spontaneous inter-specific crossing ability with J. regia. The Persian walnut grows slowly with respect to J. nigra that, on the other hand, produces lower quality wood comparing to J. regia. The Italians use a lot of European walnut logs, so I found it interesting that they prefer the wood quality to black walnut. What the heck. Here is the Tree Crops fielday too. They have said I can put it in the blogletter anyway. The beauty of Field trips is that our hosts invariably share their hard won experience and knowledge in entertaining ways. In this case the anecdotes were recounted with a dry sense of humour. For example, when initially seeking finance for this property, the banks weren’t interested in lending for a walnut growing enterprise. Apparently the bank manager asked “Is there anything else you want to grow?” When Nick said he was going to put in some kiwifruit, the bank manager said “Kiwifruit! Why didn’t you say so! How much do you want?” In fact Nick says that decades later he tangled with Arguta kiwifruit he planted as part of the nursery operation “they terrified me, you can’t control them, they grow so vigorously”. The Nelson Parkers have been members of the Tree Crops Association members since 1976. They bought this property to grow walnuts, for timber as well as nuts, and now have about 5 hectares of walnuts planted. Initially they set up a nursery to fund the venture, which they closed around 2001. They have done this,[after closing the nursery,] with no staff, no Wwoofers, “ïf we can’t do it ourselves, we don’t do it.” The walnuts from this property are sold at Ohope and Tauranga Farmer’s Markets, where there is plenty of demand. There could be useful timber on some of the older trees, now nearly 40 years old. However the timber only gets better and could be harvested at any stage over the next couple of hundred years! Within minutes of beginning his talk, this walnut expert was telling us that :” it doesn’t matter which variety you plant, none of them are any good.” That left me wondering about the tree I bought from Nick at a Tree Crops tree sale a few years back! The advice that followed was more useful; “the main thing is to pick up the nuts within 1-2 days of them falling, and wash and dry them within 4 days.” But then another blow “providing you can get them out of the shell”. The first walnuts planted on the property were grown from nuts purchased at a Tauranga supermarket. Lines were cut through the scrub and walnuts planted at 1984 stems per hectare as for radiata pine. After culling they are down to 160 stems per hectare. With seedling trees they are planted at 700 stems per hectare. Some, such as grafted “Roadside 12 ” and “Rex”, were planted in blocks at 400/ha and still thinned out. Trees with inferior quality nuts are marked with an X. Some of the trees here are on quite steep slopes. 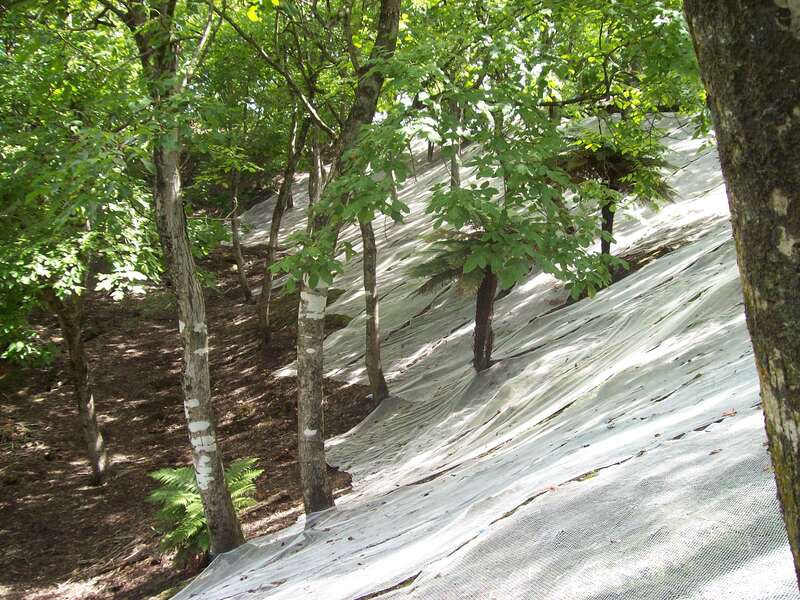 Bird netting is placed on the ground every year to help the nuts roll down the slope where they can be more easily collected by roller or by hand. Nut rollers can also be used for collecting acorns, feijoas and even golf balls. Washing is only required if the nuts are muddy or dirty. Here they are washed on old wire wove bed bases on frames.. The greenhouse is ideal for washing, as there is good light in order to identify rejects to cull. These can be hard to spot in the shade under the trees. The nuts are bagged straight away. Drying involves forcing air through a column of nuts, within a sealed box containing a dehumidifier, for a couple of days. The nuts will go off if the temperature gets too high, > 44degrees C, so the box is painted black to radiate heat. If they need to be stored till there is room in the driers, they can be left on racks in the sun with good air circulation. There is a finishing room with dehumidifier where the sacks are kept till repeated weighings show no further loss of moisture/weight. All this because quick drying is the key to a good tasting walnut. Bill Rae described seeing walnuts opening and developing roots within 4 days of falling. Storage moths can be a problem so the aim is to either store the nuts in the deep freeze or to get the nuts off the property as fast as possible. [Someone said] Bay leaves can be useful to deter these moths, place a few leaves or a branch wherever dry food is stored e.g. in the flour bin or in the pantry. Crackout rate is a key indicator. It refers to the ratio of edible nut or ‘meat’ to total nut weight with shell. Typical crackout rates for different cultivars include: Wilson Wonder 35%, Rex 39%, Franquette 50% and Roadside 12” 39% This variety met with some approval, yielding about 2 tonnes per hectare. This is another critical indicator. 1 tonne per hectare is common but not enough to be economically viable. In California and China crops of 6 tonnes/ha are being achieved. On that scale, big investments are being made in machinery to shake, sweep and dehusk the crop. Three newly imported varieties are being trialled at the Nelson Parker’s orchard. The best so far is a French cultivar called Lara with a crackout rate of 50% [43% actually]. There is a cultivar from Awakeri that hasn’t been released yet that promises a 62% crackout rate. The Nelson Parkers still plant quite a lot of seedlings, which produce a very variable tonnage per hectare compared to the grafted trees. Planting a range of varieties, whether of seedlings or grafted, is some protection against planting all of one variety and finding later that it was an unsuitable choice. As with many tree crops, the consequences can show up much later . . . On a grafted walnut tree nuts might start to be produced in year 1-2 after planting, although often 3-4 years. The fastest fruiting off a seedling tree is 18 months, but typically takes from 10 – 16 years. The grafts are done on 2 year old rootstocks. Black walnut is the preferred rootstock as it offers some resistance to phytophthora. After 30 years experience grafting Nick has gone from a 20% success rate to 50%, his grafting mentor claims an 80% success rate. With other grafts Nick will typically use a whip graft, but he uses a “bit of a tongue” on the walnuts to hold it together. Nutrients according to Nick, “walnuts need everything, and lots of it”. Nick described the soils on site as being “nutrient free. Except for too much potassium.” In Nick’s experience, the results of soil and foliage tests e.g. for boron and potassium, don’t always match with observations of the trees themselves. Codling moth can get into the nut in the early stage, October and November, and those nuts tend to fall off the tree. Later in the season, the juvenile stages of codling moth enter the nut through the base of the nut. Various members shared their favourite strategies for reducing codling moth including: solar lights placed in a bottle of water, treacle and vinegar mixtures in containers that exclude bees and bumblebees, corrugated cardboard around the trunks to harbour migrating larvae which are then removed, chooks scratching in the understory, encouraging tuis bellbirds and other insectivorous birds and UV light fly killers mounted outside from November to January. In California the native bats are encouraged by placing bat houses in the walnut orchards. Some varieties are affected differently depending on timing e.g.- Wilson’s Wonder is an early cropper, Franquette is later. For commercial producers it seems none of these remedies are completely effective. Blight outbreaks depend on the season. Wet weather around November and December is not good. Pruning the trees up, i.e. removing lower branches, which is done anyway for timber production, may help by improving air circulation and reducing splash from the ground. Copper is used in some parts of the world but application e.g. by helicopter, is not feasible on this scale. Someone asked why their own tree produced nuts with a perfectly formed shell, but a shriveled, pea sized nutlet. The long process of nut formation was explained. In mid December the walnut starts making the shell, by Christmas the shell is formed, after that the nut is filled with kernel. Any interruptions in the development process , e.g. water stress as in Californian droughts, can result in no kernel or no shell. Fortunately droughts are not common in Nukuhou. In fact the Bay of Plenty is arguably too wet for commercial walnut growing on a large scale because of diseases such as blight. Northern California is a big walnut producing area. It’s not only the humidity that is different, it is also very flat, which makes flood irrigation possible, and harvesting etc very much easier. Shade and auxins produced by walnut tree roots reduce weeds under the canopy. Herbicide is also used. Walnuts, like pecans and hazelnuts, are wind pollinated. While walnuts are generally “not hard to pollinate” the best crops form when there is a massive cloud of pollen. Male flowers, held on long drooping catkins, can be scarce. However even two male flowers on a whole tree may be enough to get some nuts. One disadvantage of higher rainfall is that the male flowers can rot on the tree. When the Nelson Parkers arrived, the site was a ‘block of scrub’. Countless trees have been planted over the decades. Many have provided lessons and/or stories: pine nuts which dropped cones through the clearlight panels in the barn roof; cork oaks, “life’s too short, you have to concentrate on one thing”; gleditseas “make great timber for turning, cut out the males to reduce seedlings”; Acer saccharum the real sugar maple as opposed to Acer saccharinum; the Meyer lemon planted well away from the other citrus near the house to prevent pips forming; male and female carobs, which have fruited; chestnuts, prickly burrs watch your feet “Disk 2 is a good variety”; fast growing paulownias; figs -Adriatic nice bitter taste, Brunswick good general fig with a long season and Brown Turkey which is too sweet for Nick but his granddaughter loves it; gevuinas which have useful foliage for floristry but the nuts “taste like dirt”; crabapples, bananas, and shag bark hickory to name a few.